Spectral Products is offering the new SM303 TE cooled back-thinned 1024 pixel array CCD spectrometer. The SM303 is ideal for UV/VIS/NIR spectrometry that requires very high signal to noise ratio and/or high dynamic range, like fluorescence, Rama, LED property testing applications. 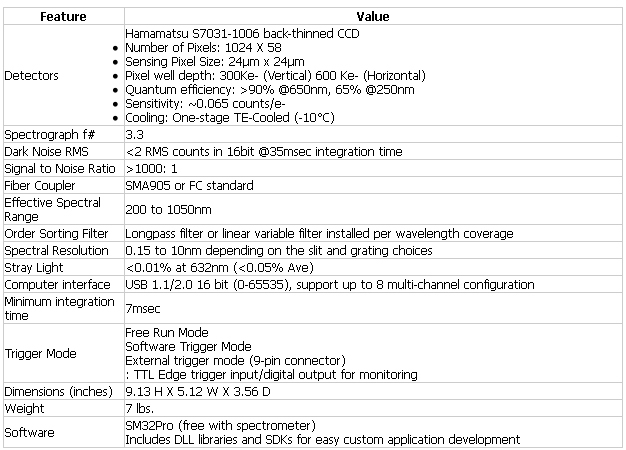 The back-thinned CCD has excellent sensitivity in UV and allows deep UV application. Well designed housing allows up to a 850nm measurement window from 200nm to 1050nm (smaller measurement window sizes increase spectral resolution and light sensitivity) with very low stray light. The TE cooled detecor also help to measure very low light signals by reducing the noise level in long integration times. Thanks to the hidynamic range and the low noise, the SM303 is also ideal for radiometric measurement applications. Standard interface to the SM303-Si is a USB 1.1/2.0 compatible interface with 16-bit. Software support includes a SDK and DLLs for dedicated applications development and our SM32Pro Windows-based spectral acquisition and analysis software.